In the early 1960's, Walter Elias Disney had plans. 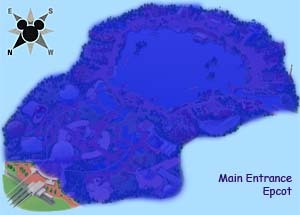 He wanted to open an East Coast park on enough land to be able to completely control the theme park environment, with no neon signs or trashy venues right across the street. It was a worthy goal, since two-thirds of the population of the United States lives in the eastern one-third of the country. It would make a trip to a Disney Park easier for more than half the country's population. But something happened to his plans, and I think it was the 1964 World's Fair. It's not hard to imagine a dreamer like Walt walking around the Fair as it was being built, thinking of how to create a permanent union of Countries and cultures, without having to wait for an event like the one in New York. But that's not what his ultimate goal was, even though it's ironically half of what Epcot has become today. (Sorta.) I think he saw countries and corporations showcasing their nations, states and products at the fair. Walt wanted to showcase his ideas, his visions and his company, beyond just some ride through attractions. He'd build a city, and the infrastructure to support it. So instead of buying a few square miles of land someplace East of the Mississippi, he had Bob Foster (his lawyer) set up seven different dummy corporations and purchased 43 square miles of land in Central Florida, much of it one acre at a time. (Some of the land was sold an acre at a time, sight unseen, for a few dollars in magazine ads, back in the 1950's. It became a common joke after it became clear that most, if not all of this land was swampland.) It was a mystery who was buying the land until the Orlando newspaper finally figured it out, but by that time the deed was done. (Yes, that could be a pun.) Walt had enough land to not only build his East Coast Theme Park, but his experimental city, residential areas, an industrial park, golf courses, conservation areas, even an airport where Celebration is today, on the other side of 192. The name EPCOT was born out of Walt's "Project X" (spectacularly unimaginatively named, though that might have been intentional) on March 17, 1966, exactly 6 months to the day after the 1964 World's Fair officially closed. 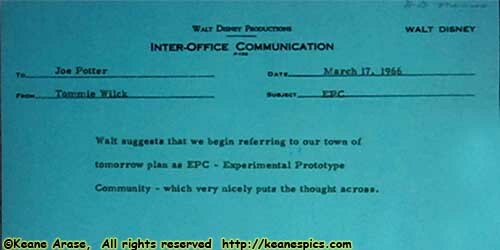 The Disney Archives found a memo from Tommy Wilck (Walt's secretary) to Joe Potter that said, "Walt suggests that we begin referring to our town of tomorrow plan as EPC - Experimental Prototype Community - which very nicely puts the thought across." The plans for Disney World and Walt's "Experimental Prototype Community of Tomorrow" moved along at quite a pace, including promotional films and other media (like his television show) to promote the idea and advertise to the public (as well as potential corporate sponsorship) not only the theme park, but a complete planned community, using monorails for longer distance high-speed travel, and people-movers as local transportation. That is, of course, until December 1966, when Walt passed away. The plans for EPCOT were officially shelved, and the entire Disney Company was without direction. The Disney Company eventually decided that running a city wasn't in the company's best interest. However, they still had 43 square miles of land in Central Florida, so they picked up the already planned pieces of Disney World, and opened Magic Kingdom on October 1, 1971. It immediately became a big hit, becoming one of the favorite family vacation destinations. Three years later in 1974 was a "gasoline crisis", where the price of gas jumped over 40%, and was becoming scarce. Gasoline lines were forming, and the families that mostly drove to Disney World (airfare was still regulated, making it almost prohibitively expensive for many) stopped coming. Attendance dropped 800,000 guests that year. Instead of scaling back, Card Walker (CEO of The Disney Company) called Marty Sklar (the new creative leader at WED Enterprises, now Imagineering) and asked, "What are we going to do about EPCOT?" It was a frightening thought in many ways. This would be Disney's first park created from scratch. Much of Disneyland was based on Walt's Movie and Television concepts. Magic Kingdom was based on Disneyland. EPCOT was supposed to be a working community (you can still see one of the models on the People Mover in Magic Kingdom) but that plan had been shelved by the company. Create concepts and sell it to Disney Management. Sell it to corporate and international sponsors. WED Enterprises was now considering two separate parks. One of them was what we know now as Future World, to be built where EPCOT was supposed to have been built. It wasn't going to be a working community, but it would pay tribute to the concepts that Walt had imagined for his city. The other, World Showcase, would be sort-of-a Disneyfied World's Fair, and was envisioned close to the Ticket and Transportation Center. It wasn't some sort of brilliance of planning that combined these two parks. (Though in the end, one can't imagine Epcot any other way.) It was the fear that they wouldn't be able to get enough sponsorship for both parks. 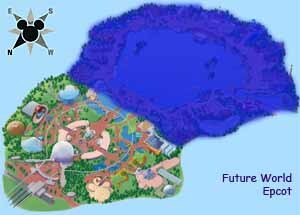 By combining the two parks, there would be enough corporate and international dollars to use as a seed money to start EPCOT Center. Marty Sklar states it was an hour before the presentation to The Powers That Be at Disney, that he, John Hench and the model shop, pushed the two park concepts together, cut, patched and painted the two models to look like it was the concept from the start, and is what we know today as Epcot. Future World started with the "Epcot Future Technology Conferences", where Disney gathered people from academia and industry, to get ideas and concepts, and to connect to those people (and companies) who were experts in certain areas. Conferences were held on Agriculture, Energy, Health, Space, and Communications. "What you should do is build it in a circle, and have a bunch of international pavilions with exhibits and shows and restaurants, make them really themed and they'll be around a river or plaza." After Walt's death, World Showcase was rumored to be one of the ideas to replace or become EPCOT. After development of Future World, WED successfully quelled those rumors, only to actually have World Showcase become a part of the replacement. But now instead of wooing Corporate Heads, WED found themselves courting Ambassadors and Heads of State, taking finishing and protocol lessons and found themselves in tuxes at State Dinners in foreign countries. They were not tux sorta guys. Of course, on home turf, things were different. In their pitch for World Showcase, they had 32 Ambassadors show up, not without some diplomatic problems. (For instance, Romania refused to show up because the Russian Ambassador would be there. Not all countries represented were friendly.) Disney immediately took their coats off, put name badges on them, and started calling them by their first name. The second night they were there, they were taken out to the Hoop-Dee-Doo at Pioneer Hall. By the end of the week, they were all calling each other by their first name, and you would have thought they were friends for years. Disney diplomacy. Huh. 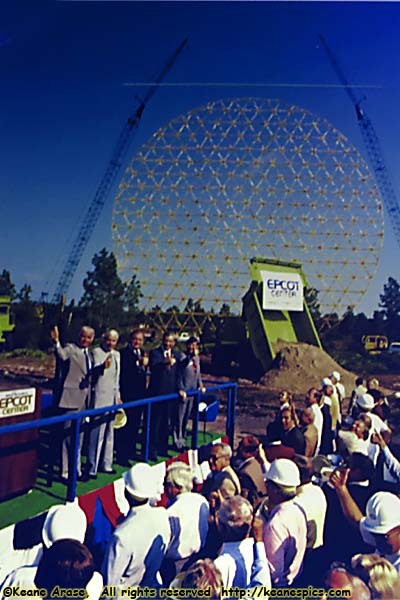 The groundbreaking event at Epcot. 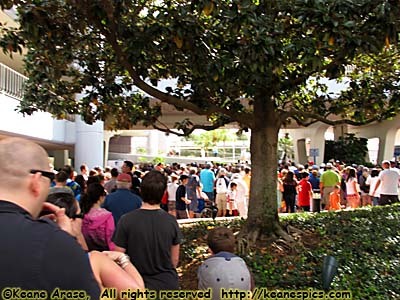 I think this was a personal photograph from one of the Legends at Epcot's 30 Anniversary Event. With Corporate Sponsors and International "Participants" on board and with concepts being reconsidered due to actual reality and physical restraints, Disney put on a Groundbreaking Ceremony. They built a road into the wilderness (and in those days, it probably met the definition of a wilderness), consisting mostly of rock, sand and pine needles. They built a 180-foot diameter circle made of Christmas garland, and hung it between two cranes and got GM to send out their largest dirt-hauling truck. They recruited former President Nixon and several former Florida Governors and brought several buses of the Press to the site. Then they set off a stick of dynamite, raised the truck bed to show the EPCOT Center sign, and construction started in the next year. It all ended 8 years and 1.4 billion dollars later, when on October 1, 1982 EPCOT Center officially opened. It's over 300 acres, making it about twice the size of the Magic Kingdom. And they serve adult beverages there. Epcot has been the third most attended theme park in America (behind Magic Kingdom and Disneyland) for years. 1982 Epcot Center Map (reproduction, original size 28" x 22"). Map probably © Disney. 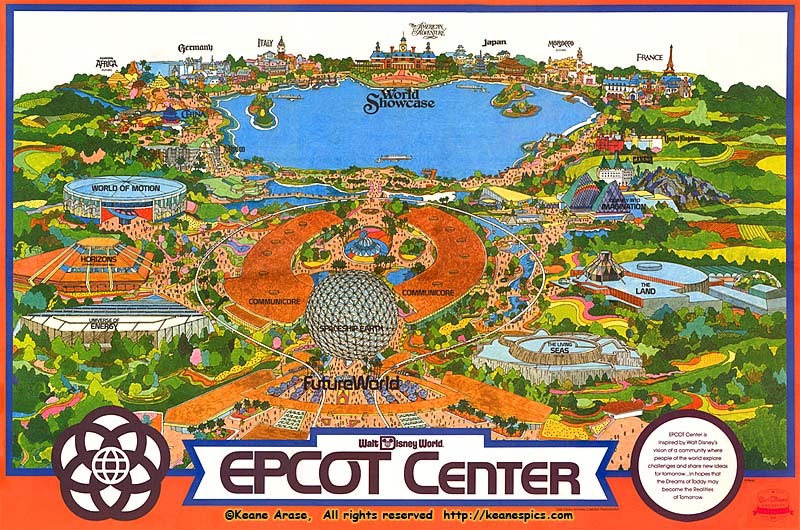 This is a scan of the Walt Disney Archive's 1982 Epcot Center map sold at Epcot Center its opening year. It was reprinted by the Archives for the 40th Walt Disney World Anniversary event. It has Horizons, The Living Seas and Morocco all marked as "Future", and an "Equatorial Africa" (which never made it to Epcot, but found a home in Animal Kingdom two decades later.). Missing is Norway, which started as a bathroom and grew into a Pavilion; and Wonders of Life, now a seasonal Events Pavilion. The Entrance Area is pretty much like all the other Entrance Areas. Bag check, Guest Services, ticket booths, a place to buy things, etc. Epcot also has a station for a monorail that will take you to the Ticket and Transportation Center. If you take the monorail inbound toward Epcot, you are treated to an overhead view of Future World. While the entrance was always supposed to be here in front of Spaceship Earth, moving it to the junction of Future World and World Showcase was once considered, but quickly rejected due to corporate sponsorship restraints. More about this later. If you ever look at a map of Epcot, you'll see the parking lot is ringed by a road called Woodpecker Lane. Wait, you ask yourself. Isn't Woody a Universal Character? The name actually commemorates a small, protected woodpecker that was found when the crews were clearing the land for Epcot's parking lot. If you look, there still exists a stand of pine trees where the bird once lived, which should obviously be part of the parking lot. My Leave A Legacy tile. 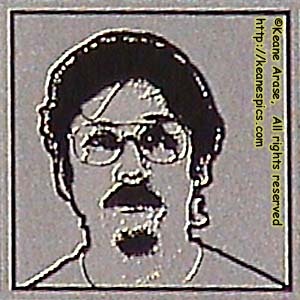 No, it's not a wanted poster. No, I didn't have a beard. No, I don't know what that tumor thing that's growing out of my neck is. Yes, I do have hat hair. I'm at East 6-D-17-6-4 is you want to visit me. They're now getting a little old, and the kids that sit on the stones (and just where are those parents?) rub their shoes over them, and wipe out the print of those plates in noticeable arcs. Perhaps it's time for them to go. It's a large area that forces guests to funnel through past the stones, though that could have been one of their intended purposes. Take the aluminum plates and remount them someplace else, perhaps a Leave A Legacy gallery along the paths where there are large blank walls, or even in the bus area. 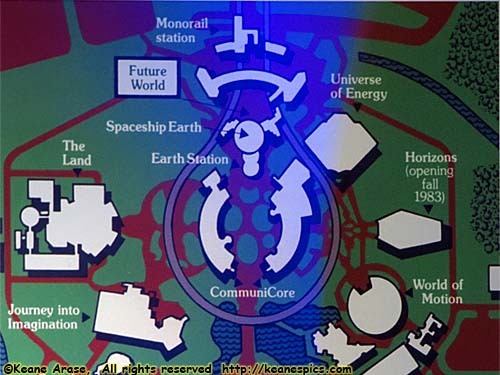 Future World was supposed to be Tomorrowland done right, a showcase that displayed the latest in technology and engineering; what could be done, and what the future could and would look like. Unfortunately for the Imagineers, this thing called the microprocessor was in its infancy when the park was being planned and built, and they had no idea how that little silicon wafer would change the world. It is astounding how much the computer has transformed just about everything in the past 30 years since the park has opened. This isn't to say they didn't foresee the computer's importance. They even had an attraction about the computer, called the "The Astuter Computer Revue" in Communicore. It was a wee bit...painful to see today, if you can find a copy someplace. It featured a character named Earlie the Pearly who presented The Computer Song by the Sherman Brothers. It still holds the record for the shortest lived attraction in Epcot (The show closed in 1984). It's technically a sphere, but in reality it's two geodesic domes. However, since the radius of the domes match, it becomes a complete sphere when put together. 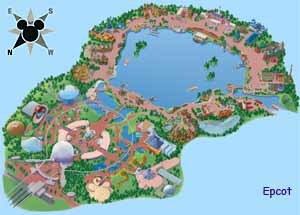 When Disney was designing the park, John Hench (one of the principle park designers) was told it was impossible to be able to complete the sphere. Upon pressing the engineers how much of the sphere they could build, he was told the top 75%. So he had them build the top 75%, but on a raised circular platform that's held up my those massive legs. The bottom 25% is hung from this very same platform, which completes the sphere. Okay, stupid trivia time about the golf ball, as presented by Imagineers Jason Surrell, Jason Grandt and Alex Wright. Spaceship Earth is 165' in diameter. The surface is composed of 11,448 triangles in 3816 pyramids and there are 954 panels of 4 pyramids. 1.63 billion golf balls will fit in it. If Spaceship Earth was a golf ball, Tiger Woods would be 1.35 miles tall, and he could drive it to Ft. Lauderdale. 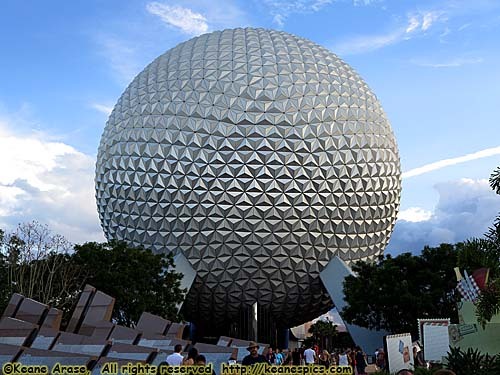 If Spaceship Earth was the Sun, Earth would be 15 feet in diameter at the entrance to Magic Kingdom. 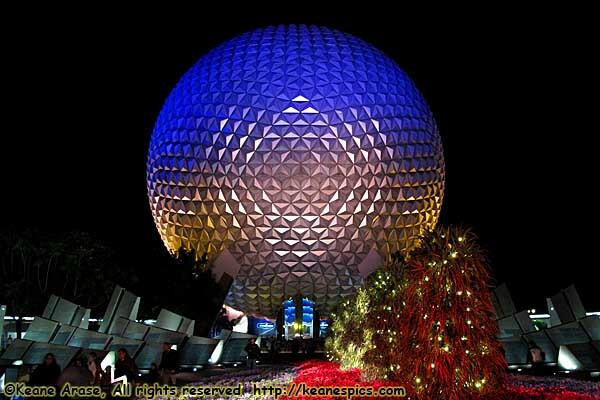 If Spaceship Earth were the Earth, the Moon would be a 40' diameter sphere that would pass through World Showcase. Disney decided to go all out for the millennial (since the main celebration would be in Epcot, or more to the point, in World Showcase) and since none of us will be around for the next 1000 circles 'round the sun, put some headgear over Spaceship Earth. It was cool for a while. In 2001, with the Millennium over, the "2000" sign no longer made sense, but it didn't make cents (<--ha ha, pun...) to just raze the structure. My cynical being says Disney had to depreciate the structure just a few more years. So they put a big "Epcot" above it, just in case you didn't know where you were. In 2006, enough complaints must have come in, and the wand came down, and Spaceship Earth is the golf ball it always was. Once on a vehicle, they take a digital picture of your vehicle before they let your eyes start to get accustomed to the darkness, and it's on par with Haunted Mansion as a very dark, dark ride. As a matter of fact, it also uses a similar ride system, essentially an endless drive chain which snakes its way up, then down through the show building. Attached to that chain are ride vehicles with the ability to swivel 180 degrees. This ride has a throughput of some 2,500 guests/hour, but will be less due to stops if more time is needed at the load or unload platforms. The second half of the ride begins when the ride vehicle is turned 180 degrees so the guest stays planted in the seat on the way downhill. You're asked a half-dozen questions via a touch screen, then based on your answers shows what the future could bring. Using facial recognition technology, they isolate your head from the picture taken at the start of the attraction, and uses it as a crude, Monty-Pythonesque type animation. You can send e-mail to yourself (or others) a link to the video. Fun and somewhat impressive the first three or four times. If you're alone in the vehicle, they just make two of you. Here's an example of the final product. End Epcot - Part 1 of 9.